1. Cut all of the flowers and leaves from the bouquet. (Mine had leaves because it was a fall specific bunch). 2. If your bouquet has leaves, fill the jar with them. Arrange the flowers as you please. 3. Tie twine or yarn into a bow below the rim of the jar. If you have thin string, I recommend folding it several times and then wrapping it around to get a thicker line and bow. And that's it! Seriously! This is such a simple and inexpensive way to add a little pizzazz to your table for Thanksgiving, windowsill, mantle, and more. Best of all, this project can be modified to reflect any season or holiday, as well. 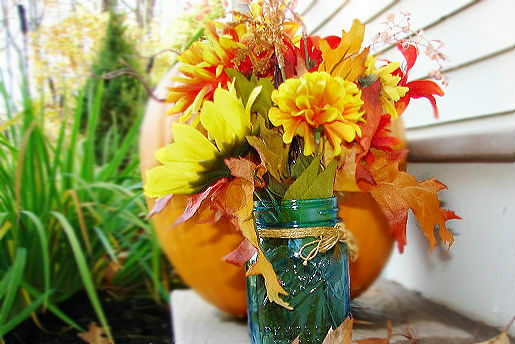 So find that mason jar a home somewhere in your house and change it up throughout the months! Love it, it looks cute and it's perfect. I love your blog!!! This post is amazing!!!!! !